Is your visit to Twikkii Island lacking something? Are your beach bums tired of building sandcastles? Do your beach goers need a means to show off their abs? (Do your beach goers need a means to actually develop those abs?) Fear not! I give you something EA should have given us when they made Bon Voyage: Surfing! This is a new, socialable self-interaction with a custom queue icon and custom animation. Surfing is available for Sims who are Teens and older (who aren't in the "showing" stages of pregnancy) and who are not Servos. As you would expect, surfing is only available on beach lots and a Sim must have a surfboard in their inventory. (Surfboards make great gifts, by the way. ) Because I had to make changes to the wave effect object, I made a default override so that all beach lots should be ready for surfing. Bon Voyage is required. The interaction itself (plus some additional, necessary files: the wave effect override, a cart object which holds the Sim and a routing NPC). 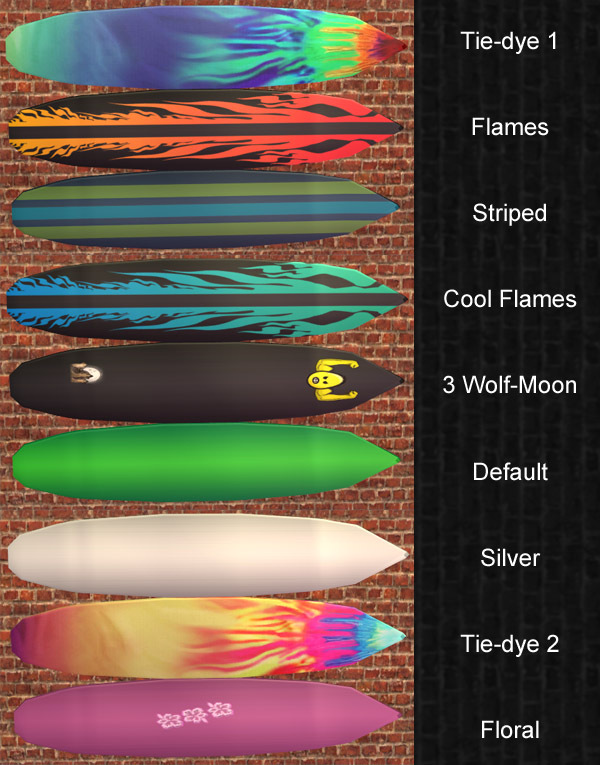 Surfboard object with 50 recolors! 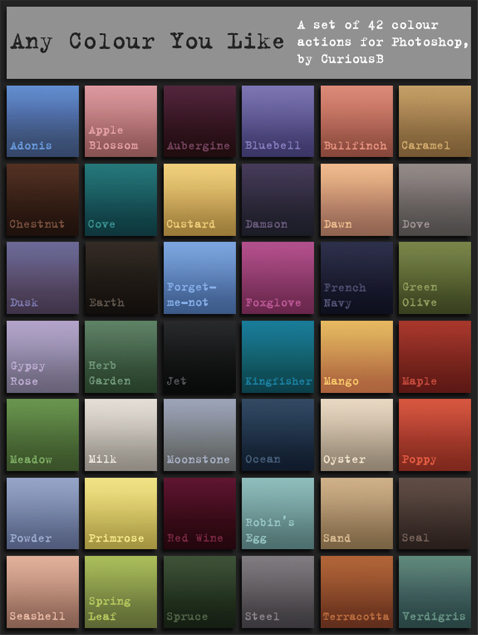 (42 are CuriousB colors and 8 are more of a "novelty" kind). According to SimPE, there are 304 faces and 314 Vertices in the surfboard. The surfboard can be found in the "Exercise" area of the "Hobbies" area in the Buy Mode catalog. Two wall-mounted surfboard racks: a 1-tile version and a 2-tile version. (Each has 252 faces and 288 vertices according to SimPE.) They can be found in the "Shelves" section of the "Surfaces" area of the Buy Mode catalog. 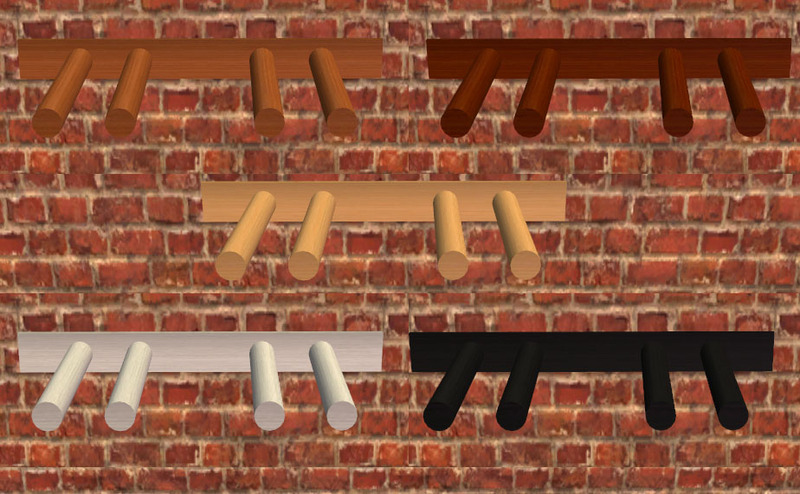 June 9th, 2011 UPDATE: Surfboard racks have been updated so that they should no longer be lightning strikeable or flammable. Although Apartment Life is not required, each rack is shiftable for AL users and comes in 5 wood textures which match the Knock on Wood medium shelves. The 1-tile version is repository linked to the 2-tile version. The 1-tile version can hold up to two surfboards in a vertical orientation. The 2-tile version can hold up to five: up to two vertically (like in the 1-tile version of the rack) and up to three in a horizontal orientation. Whichever grid square over which you place the surfboard using the hand tool determines the horizontal/vertical orientation (i.e. the slots of each orientation are mapped to a grid square). Press "M" to toggle slot placement. switch "stdMatAlphaBlendMode" to none, "stdMatAlphaTestEnabled" to 1, and "stdMatAlphaRefValue" to 255. That will turn masking on without turning on alpha blending, which basically allows you to have alpha-based cut-outs without the weird overlapping. July 16th, 2011 UPDATE: "No Surfing" sign. When placed on a lot, the "Surf" interaction will not appear on the Active Sim. An invisible recolor is included for the base and the sign. It can be found in the "Miscellaneous" subsection of the "Decorative" category in Buy Mode for $100 (the same as the Sim Crossing sign from which it is cloned). While your Sims don't need to worry about sharks or dangerous coral, Sims can still Wipe Out based upon a sliding scale of their Body skill. That is, a higher body skill will mean a lower chance of Wipe Outs. The probability of Wipe Outs can be edited in the BCONs if you so desire. Surfing is a self-interaction; you click on the active Sim and select "Surf." However, if there are other surfers present, you can invite them to join you for a mutual social and relationship boost. While there is no relationship-based requirement/rejection for an invitation, there won't be a relationship boost if the Invited Sim isn't "in the mood" to surf (but that won't necessarily stop the Sim who invited him/her from surfing without him/her). If there are more surfers than there are available waves, would-be surfers will congregate to the side and will cheer on the other surfers until the surfing space they want becomes free. Sims may cheer before they decide to actually enter the water anyway. If you maximize/100% a Sim's body skill while surfing, the custom "surfing" queue icon will appear in the expanded/"full text" version of the 100% Completed Skill memory for that Sim. This is a feature. Surfers will gain body skill and Fitness hobby. You can only ask Sims to join before you actually start surfing through the Invite dialogue. While your Active Sim is surfing, you cannot simply click on a Sim who recently appeared on the lot to ask them to Join; likewise, you cannot click on a surfing Sim and select "Join." It must be done through the Invite dialog. If there are other surfers available but you want to surf alone, don't add anyone to the list and just click the button with the checkmark. The button with "X" will cancel the action. The relationship boost is only between the Active Sim and each individual Sim invited. (So, if Don invites Nina and Dina, only the Don-Nina and Don-Dina relationships will be affected...not the Nina-Dina relationship). For technical reasons, the "Surf" pie menu option will not show up while the Sim is currently swimming; this is intentional. You may find it silly that a Sim already swimming in the ocean would have to leave the ocean just to get back in, but there are technical/logistical reasons. Just imagine the Sim had to get his/her surfboard. Do not leave the lot with your Sims surfing. The NPC gets deleted when the lot is reloaded. If your Sim is surfing, he or she will be deleted with the NPC. In my tests, they will be reset by the mailbox. Because of the override, I'll remind everyone to please scan your lots with Clean Installer to make sure nothing gets included that shouldn't. Yes, you can sell the surfboards in an OFB shop. It's one reason why I created the surfboard racks. Just be careful to set the actual surfboards for sale and not the rack itself. With SilentLucidity's Angled OMSPs, you can also have surfboards leaning against buildings or fences or sticking out of sand dunes. The surfboard should show up in the neighborhood view. "HELP! I have downloaded everything but I still cannot surf?!" -Is your Sim on a beach lot? Your Sim must be on a beach lot. -Does your Sim have a surfboard in their inventory? Your Sim must have a surfboard in their inventory or the option will not show up. Sims must have a surfboard to be considered a surfer. -Is your Sim a Teen or older? The interaction is currently limited to Sims who are Teens or older. -Is your Sim a Servo (robot)? Robots do not like water and thus find surfing to be too dangerous. -Is your Sim in the "showing" stages of pregnancy? If your Sim has a visible pregnant belly bulge, he/she is under strict doctor's orders not to surf since a violent Wipe Out may hurt the unborn child. Hey, blame the doctor not me. -Is there a "No Surfing" sign somewhere on the lot? The "No Surfing" sign prohibits surfing on any lot that it is placed. -Is your Sim already swimming in the ocean or in a pool? The option will not appear on the Active Sim if he/she is currently swimming. Direct the Sim to dry land and the option should reappear provided the above criteria are met. -There are occasional timing issues in which the Sim may start surfing too soon, start surfing too late, surf too slowly (i.e. the wave overtakes the Sim), or briefly surf in the wrong direction (which is especially noticeable in the event the Sim performs a delayed or two sequential show-off animations). If someone knows a thing or two about BHAVs, I would love some advice on how to correct this. I've been content with the timing being an approximation, but perfection would be ideal if possible. 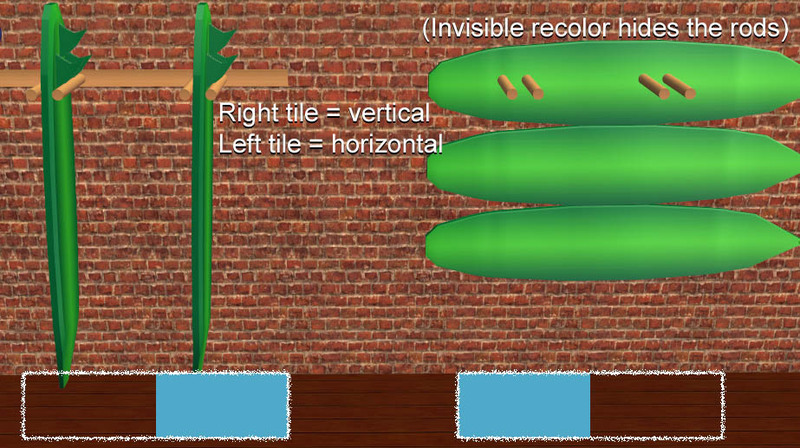 -Sometimes the timing of the splash sound effect on the paddling animation is a bit off. -Possibly obsolete issue: Some time ago, I would occasionally find waves becoming stuck "in use". This doesn't seem to be a problem for me anymore. However, I have created a debug interaction to combat this on the surfboard racks should the issue reappear. The interaction is on the racks because you can't really click on the wave effect object. You must have debug mode enabled and must shift-click on a rack. The interaction will delete any surfing NPCs on the lot and clear the "In Use" flag for all wave objects after you confirm that this is what you want to do. If you use this debug interaction while any Sims are surfing, it WILL delete the Sims currently surfing. There is a prompt reminding you of this before it actually does anything so that you can back out of it if you want. If there is anything else I'm forgetting, I'll update this thread. If there is anything wrong or needs to be tweaked, I'll update the mod. -Echo: For the surfboard mesh, which is far superior to my attempts, as well as her help and tutorials. None of this would be possible without you. -Inge Jones: For her portal revealer which was so vital in helping me figure out what to do with the ocean. -CuriousB (Bagfran at LJ): For her macro (link). Beautiful colors! -Anyone else who has helped but whose name escapes me now.